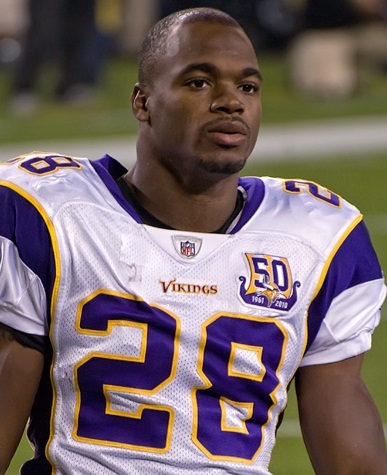 A boy who was just two-years old who reportedly was the son of Adrian Peterson the star running back for the Minnesota Vikings died on Friday from injuries suffered after he was allegedly abused. Police from the South Dakota city of Sioux Falls said that Joseph Robert Patterson, who is 27, had been charged with aggravated assault and battery on a child. If the man is convicted on both of the charges, he could face as many as 40 years behind bars. Prosecutors are also considering additional charges in light of the death of the boy, said police sources. Shortly after the news was made public about the death of the boy, Adrian Peterson sent a message on Twitter expressing his gratitude to his entire family, fans and the fraternity of the NFL for all the support. Patterson phoned police Wednesday at 5:45 pm reporting that a boy who was two was choking in his apartment, said a spokesman for police. When officers arrived, they found the child unresponsive and rescue personnel rushed him to a local hospital. Law enforcement authorities were able to determine the child suffered head injuries consistent with abuse. Police said that Patterson, whom they said was the boyfriend of the mother of the injured child, was the only other person besides the child at the residence when police arrived. Authorities arrested Patterson and his bail was set at $750,000 prior to the boy’s death. The mother of the child was not being investigated said authorities. Authorities declined to give the name of the child, with police telling the pubic the information was withheld to give them time to notify those involved. Nelson Peterson, Peterson’s father, told a local newspaper that the young boy was his grandson and Adrian was the father. Peterson, the NFL Most Valuable Player in 2012 did not elaborate on the incident when he spoke to reporters on Friday.